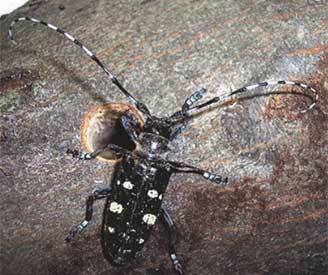 Also referred to as ALB; longhorned beetle, roundheaded borer. 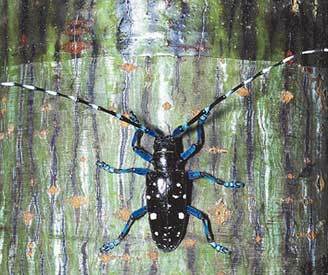 Large beetle is black with white spots and has blueish appearing legs; about 1-1.5 in. long (color pattern is opposite cottonwood borer). Antennae are black with white bands. 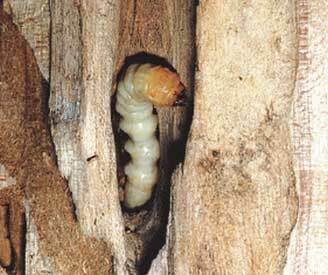 Larvae are white and may grow to 1.5-2 inches long. Beetle has one year lifecycle (in most places). Learn more here. 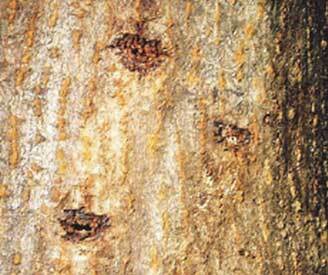 Prefers maple, willow, elm, horsechestnut and birch, but feeds on 13 different genera of hardwoods. Introduced from Asia. First found in New York in 1996. Spreads through the movement of wood products and as hitchhikers on vehicles or in cargo. Larval galleries under the bark, top dieback and out of season yellowing of leaves. Dime-sized (1/4” or larger), perfectly round exit holes in the tree. Frass and sap may be found at exit holes. No known infestations in Nebraska. Currently found in Massachusetts, New York and Ohio. Eradication programs are in place in each of these states by the USDA. Current range information can be round here.